"Hello Apollo, we old school riders great you!" A new kite in an old shape! This high aspect ratio kite is not a new shape, but brings back good memories. In the old days the manufactures made these high aspect ratio kites, trying to find a solution for the basic kite pull that disturbed the upwind capacity of all kitesurfers. In those days, kites didn't depower a lot or actually not at all. The only way you could control your speed was edgding hard to force the kite to the edge of wind window. High aspect ratio kites loved that wind window edge. They loved it so much that they easily passed the edge of the wind window and drop out of the sky. A problem that seemed hard to control. After a few years the 5th line & bridles came. That gave the manufactures the right tools to play with the kite angle of attack. The kite control & up wind solution was found. Manufactures turned to the more lower aspect shapes. 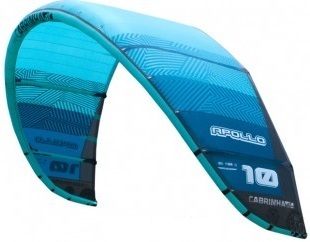 Great for overall performances, but that really floaty feel "mostly" disappeared in the tube kites. Now in 2016 we see the old shape back again and that's great news. "Hello Apollo, we old school riders greet you!" Cabrinha brings the old shape back to life. Most of the high aspect ratio diseases are gone. 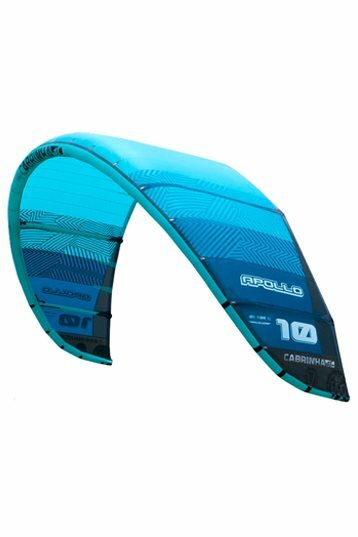 The Apollo is very stable, never drops out of the sky, the turning is fast and the floaty jumps are back again. 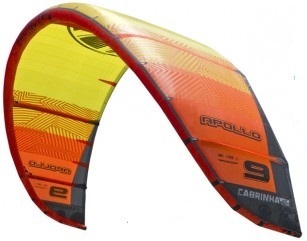 Even in the lightest wind, riding a hydrofoil, the Apollo won't let you down. Except on one point. Light wind relaunch, that's an issue to resolve. Good depower low & high end winds. Clean safety. Great bar feedback! Hydrofoiling in light wind with a 12m Cabrinha Apollo. The characteristics says it all. The most important characteristic is the great Stability in light wind, on the other side the Apollo is hard to restart in light winds. A steering line restart (backwards) wasn't possible. Just rode the new Apollo to try the Fireball, but it is the Apollo that got all of my attention.